August tends to be a combination of savoring the last few weeks of summer all while preparing for back-to-school, cooler weather and fall festivities (never too early to start watching Hocus Pocus for Halloween!). 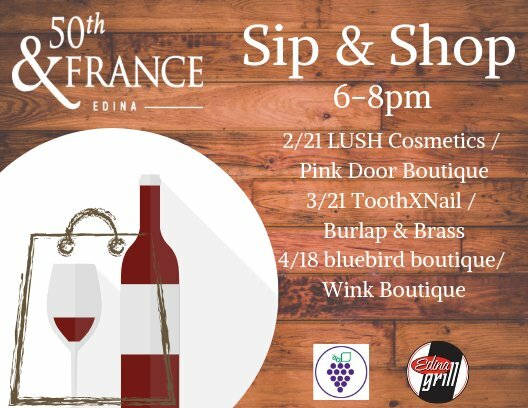 We gathered all the new styles, events and fun things happening at 50th & France over the next couple of months. Grethen House - Shop warm tones and rich textures for the upcoming season. Transition your wardrobe for fall with pieces from Re/Done, Isabel Marant Étoile, Golden Goose, MM6, Simon Miller, and Veronica Beard. prAna - New fall styles for women and men. bluebird boutique - It's all about a straight leg this fall! Parc - Fall styles arriving daily + our summer sale continues at PARC, come visit us in-store or shop online. Free shipping on all US orders over $100! Corset Styling - Corset Styling & Fashion Boutique has begun the transformation into a fashion concierge business. Beginning in September, the new business name will be Jodi Mayers & Style Partners: a team of independent stylists. Throughout August, all clothing, accessories, furniture and fixtures remain on sale. Stop at Corset Styling today. R.F. Moeller Jeweler - Visit R.F. Moeller Jeweler Thursday, September 21 through Saturday, September 23rd for the most sparkling weekend of fall: The Exceptional Diamond Event. The shop will be filled with diamonds, from loose stones to rings to tennis bracelets. And to top it off, they are offering exclusive discounts throughout the weekend. Fringe Accessories - Fringe Women's Accessories is one of the best-kept secrets in theCities for brides. We offer the finishing touches, from head to toe for the bride, bridal party, and wedding guests. Shipments arriving daily with new treasures including rose gold jewelry and hair pieces. Open every day and always available for private appointments. Burlap & Brass - New Fall Sweater/Jackets have arrived!! And they will quickly become your new go to- we promise!! Spalon Montage - Get a fresh, new look or simply indulge yourself with a massage. STEELE Fitness - You can’t put a price on convenience.From personal training to group classes, STEELE Fitness located on 50th and France in Edina has something for everyone. Early risers or night owls, we fit every schedule. Contact us today for membership information! Aesthetic Institute of Edina - Refresh your face with new treatments to prepare for drier months. Zel Skin - Eliminate fat without surgery or downtime and feel great from every angle. Zel Skin & Laser Specialists was the first clinic in the Twin Cities to provide CoolSculpting® treatments and has been successfully sculpting abdomens, flanks, and thighs since 2010. Now, we can now sculpt your arms for the firmer, more toned look you’ve been wanting. Call 952-929-8888 today to schedule your complimentary CoolSculpting® consultation or visit www.zelskin.com/coolsculpting for more information. Pacifier - Show off your family's wild side this fall with Oyster's Pearl's line of unbearably adorable t-shirts and onesies, now available at Pacifer Edina. Gather - Decorate with fall styles to keep your home feeling warm and cozy. Arezzo Ristorante - Hand tossed Neopolitan pizza! Red Cow - Red Cow updated their wine list! Arthur Murray Dance Center - Arthur Murray as been teaching the world to dance for over 105 years! From Foxtrot, Waltz, and Tango to Salsa, Rumba, or Cha Cha and more, they teach it all at Twin Cities Arthur Murray Dance Centers. Dance or fun, fitness, stress relief, passion, excitement, and more. Dancing is for everyone! Dancing is easy, glamorous and FUN! First lesson is free for Edina Chamber members. *new students only. We offer one-on-one lessons with a professional instructor. Lessons are set up by appointment at your convenience. No partner needed. We welcome singles, couples and even groups of people. Classes are ongoing so you can start at anytime. We offer private lessons, group lessons. and dance parties. Weekly practice parties so you can use shoe off what you've learned and have fun! Specialized dance lessons for your wedding.